Renewable Energy Sacramento: Most Efficient Renewable Energy Sources? 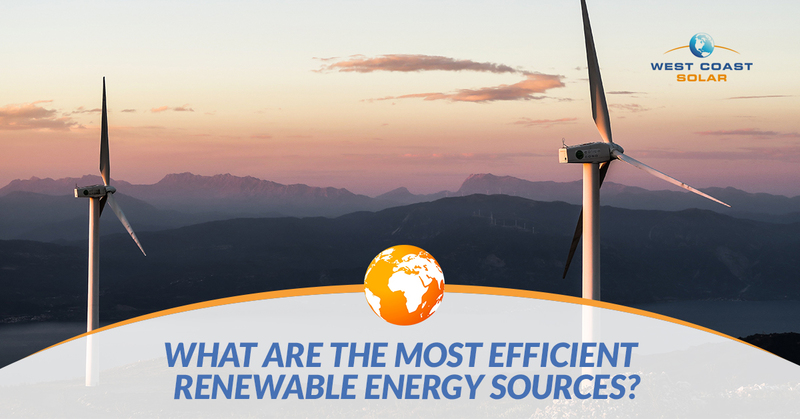 What Are the Most Efficient Renewable Energy Sources? There is a lot of talk about the future of renewable energy. Both private individuals and businesses are eager to make the switch to power their homes and offices through renewable energy. Many aren’t waiting for the government to mandate the switch but instead forging ahead on their own in an effort to reduce their carbon footprint and their reliance on fossil fuels to power their lives. But can these eco-friendly sources really replace traditional energy sources? Are they really efficient enough to keep up with the demands of today’s modern homes? Before you make the change to renewable energy, it’s important that you research the pros and cons of the available sources and determine which is the right choice for your home or business. Geothermal energy is made by harnessing heat energy from within the earth. It might come from hot water found under the surface of the earth or it might come from magma, the molten rock that we more commonly associate with volcanoes. The heat from these sources can generate electricity without depleting the sources from which it is made. Wind energy is generated by wind turning the blades of turbines to power an electricity generator. You’ve probably seen these wind turbines while you are out driving; they are usually very tall, white structures with three blades, sort of like a streamlined windmill (which is a form of wind energy as well!). This is the energy created by capturing energy from the sun’s rays. Most commonly, this kind of energy is created through the use of solar panels, usually placed on rooftops or in large groups of panels in an open space (sometimes referred to as a “solar farm”). This is electricity that’s creating by capturing the energy in fast-moving water. This might be falling water or the movement of the tides. Turbines are placed in the water, much like wind turbines that capture wind energy. This energy comes from burning wood and organic matter such as waste from crops, grasses, and animal waste. While the burning of these materials does produce carbon, it’s still considered a renewable energy source because new organic material can be grown to replace the material that’s used. This certainly isn’t an exhaustive list. There are many other renewable energy sources out there, including biogas, radiant energy, and compressed natural gas among others. But the ones we’ve listed above are the most common as well as the most promising when it comes to integrating them into today’s homes and businesses. When it comes to determining efficiency, we have to take into consideration the costs associated with harnessing the energy versus the output that the method creates. According to an infographic created by the New Jersey Institute of Technology’s graduate program, the most efficient source of renewable energy is wind power, coming in at an astounding 1164% efficiency. However, that same infographic points out that there are a number of disadvantages of wind energy that have to be taken into consideration. Unsightly and noisy. Turbines are big and dominate the landscape they are in, which can take away from the beauty of the natural surroundings. If they are close to human populations, they can be a noise nuisance. Tough to transport to remote locations. The windiest places are often the most remote. That can increase costs significantly because the large machinery will need to be hauled to these remote destinations, as will the technicians who can install and service them. The costs get even worse if you are talking about off-shore wind farms. Deadly to bird populations. Wind turbines kill hundreds of thousands of birds every year. That could pose a serious risk to bird populations, especially if the turbines are places along migration paths. While there is certainly a place for wind energy in the landscape of renewable energies, it’s solar power that could be the clear winner in homes and businesses. Solar comes in at over 200% efficiency, so it’s efficiency cannot be dismissed and it offers a number of clear advantages over wind energy for the individual consumer. First of all, no home or business owner is going to purchase and install a wind turbine on their property. But installing solar panels on their Sacramento roofs is easy, affordable, and blends in with the current roof to become virtually unnoticeable. Secondly, solar energy is the cleanest energy source to harvest, posing no threat to the wildlife, the environment around the solar panels, or even to the sun itself. It constantly renews without any interference from us! Solar is also a much better match for our energy demand than wind is. Solar power peaks when it’s hot—exactly when people want to crank up their air conditioners. Wind power peaks in the middle of the night when people are using a lot less power. What’s the Most Efficient Energy for the Future? While there is a lot of debate about the most efficient renewable energy source, almost everyone agrees that the future of powering our homes and businesses will come from a combination of these sources. You may get your energy from a combination of solar and wind while falling back on biomass energy when necessary. That way you have all of the energy that you need without depending on one source or depleted natural resources on the planet. Whatever that ideal combination ends up to be, you can get a jump start on it today by installing solar panels on your Sacramento home or business. We can help! Get in touch with our team and let’s talk about your installation needs. Give us a call or contact us through our website and we’ll create a customized plan for solar panel installation on your property.